Home » Social Commentary » Which Australia are we celebrating? Which Australia are we celebrating? Last week, Premier Daniel Andrews said that Australia Day was a great day to celebrate multiculturalism. This might be true in the leafy inner city suburbs, but my experience of Australia Day celebrations from the outer suburbs presents a reality at odds with Andrews’ version. This Australia Day I’ll be celebrating it like many. A barbecue with friends, beer at the ready, pool by my side. The Hottest 100 will be playing, and no doubt, ‘Straya’ will be bellowed out of a few boisterous mouths before the day is done. It’s a great day to be patriotic. We’ll pat ourselves on the back and remind each other how lucky we are to live in this blessed land of the South. With the obvious caveat that there’s not much for our indigenous population to celebrate on January 26th, the day is a jingoistic holiday that permits our self indulgence. But what are we celebrating? 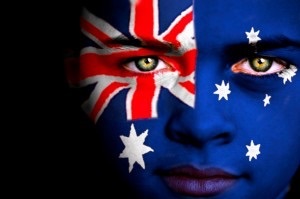 Are we celebrating present Australia, with its pluralism and multicultural facets? This is clearly the Australia Mr. Andrews has in mind. Or are we celebrating an idealised version of the past? For many, Australia Day is now an exercise in nostalgia when citizens drape themselves in the flag as a show of salient defence against a perceived existential threat? I have my doubt that many barbecues in the outer suburbs and rural areas will be celebrating present Australia on January 26th. This Australia is multilingual, diverse, cosmopolitan and uncertain. This Australia is almost threatening to many living beyond the comfort of the city. Free trade has sent manufacturing packing, and competition for skilled jobs is fierce. The certainties of the past are now clouded, and our identity is difficult to characterise in simple terms. This reality, this modern Australia, is not what flag waving, beer guzzling patriots in the backyard are celebrating. Rather, the celebration of Australia Day for many is not just a declaration of love for their country, but a nod and yearning for the identity lost over years gone by. What’s happening in the inner city is a world removed from the outer suburbs, and this reality is no more stark than Australia Day. Are we a white, English speaking nation? Not anymore. Certainly that’s still the most common demographic, but it is no longer the dominant certainty that it once was. Yet the degree to which this reality has been universally accepted is highly questionable. How often do we hear it? We are losing our identity. Our way of life is under threat. These sentiments manifest into a nationalistic fervour late January. The message being that we value what’s been and are suspicious of what is or will be. Undoubtedly, Australia Day is the most conservative day on the calendar. The reality is that as globalisation has brought home the reality that our nation is more interchangeable and less tangible than it once was, the national holiday has become more pronounced. Shops fill with patriotic paraphernalia and what’s Australian and what is not becomes a direct focus. It’s ironic that our national day, more than any other holiday, causes division. In some ways, it’s become exclusionary. If the focus point is grounded in the past, then there’s little for recent arrivals to identify with. White, Anglo, fifth generation Australians hold the monopoly on the day. This demographic will be the most vocal and conspicuous, because they perceive that they have the most to lose. Yet it’s true that public holidays are by their nature a celebration or remembrance of events from years long gone by; Anzac Day, Christmas Day, Good Friday, they are all grounded in history. Australia Day is no different. However, if we want this day to be true reflection and celebration of our nation, we need to recognise the Australia we currently inhabit, and there is much to celebrate. The parades in Federation Square and around our state capitals might present the appearance of an Australia comfortable with its cosmopolitan self. But a peer over the fence to the sprawling suburbs paints something different. 2 Comments on Which Australia are we celebrating? Gee, I’m white, Anglo, 5th generation SA born. Didn’t realise I had such an AD hold? But yes, I think we are we are saddened by where this country now stands compared to the past, but life, events never go backwards. But we yearn for the understanding of historical events that created this country, not the multicultural political correctness of the left (and right sadly) that now dictates what we should or should not do in the way we live. – Er, what capital city are you talking about? In the Australia I know in 2015 it’s the suburbs that’s particularly diverse whereas the inner city are now increasingly dominated by the (white) yuppies/hispters/professionals/what have you.